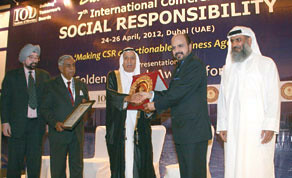 Doha Bank, one of the leading banks in Qatar, has won the “prestigious” Golden Peacock Global Award 2012 for corporate social responsibility (CSR) for the third consecutive year. Doha Bank Group chief executive officer R Seetharaman received the award from Juma al-Majed, chairman of Dubai Economic Council at a ceremony of the 7th International Conference on Social Responsibility attended by distinguished CSR leaders, bankers, academics, environmentalists, economists, legislators and policy makers at Dubai Festival City InterCon Hotel, Dubai on Thursday. Seetharaman said: “This truly is a milestone achievement in our efforts towards setting the example as a responsible corporate. We at Doha Bank believe that it is not just about money and that we have to give in return to the stakeholders who place their trust on us. “This achievement would not have been possible without the unstinted support of the Qatar Government, the principle regulatory bodies, our visionary board, business community, worthy investors, loyal clientele, society at large, and promising employees – this award is dedicated to you”. Earlier at the global conference, Seetharaman spoke on “corporate social responsibility – a bridge between business and society”. He said: “Corporate social responsibility should voluntarily contribute towards sustainable development in three areas namely people, planet and profit. People represent the social development, planet represents contribution towards environment development and profit represents economic growth, which has to be sustained to finance environmental and community responsibilities. Highlighting the importance of CSR for corporates, Seetharaman said, “Corporate social responsibility activities have the potential to create several distinct forms of value for customers. It is the customer perception of this value that mediates the relationship between CSR activities and subsequent financial performance. CSR leads to outcomes such as increased customer loyalty, willingness to pay premium prices, and lower reputational risks in times of crisis. Improving customer satisfaction, creating products that are easy to use and securing quality are some of the CSR measures which benefits the customers. Today, corporates must help to build the social and environmentally acceptable standards necessary to support their economies. “Organisations should undertake initiatives to promote greater environmental responsibility. Organisations should encourage the development and diffusion of environmental friendly technologies. Organisations should support precautionary approach to environmental challenges. Doha Bank maintains a well defined environmental policy with the principles of “reduce, reuse & re-cycle”.